The Strength card represents the courage, inner strength, and self control of the enquirer. It can also indicate the influence of a woman who is well disposed towards the enquirer. The card ‘Lust for life’, also known as strength or endurance card symbolizes zeal and spontaneity in life. These qualities infuse us with enthusiasm to live and work. They provide us great strength and support to face the ups and downs of life. 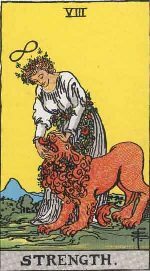 The card shows a young and innocent girl trying to open the jaws of a lion to see what is inside his mouth. The very act of trying to grapple with the lion indicates the courage to fight against the daunting odds of life. The appearance of this card means that the subject is adventurous enough to walk straight into hazardous zones to explore the unknown secrets of life. We know there are people who derive lots of pleasure and satisfaction from their adventurous pursuits.